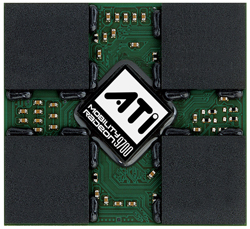 ATI Mobility Radeon 9700 – All the details - ATI's Mobility Radeon 9700 - What's in a name? As you no doubt expect, the Mobility Radeon 9700 is based on the R360 architecture; its desktop brother being the Radeon 9600 XT. So, like we mentioned in our mobile GPU Q1/2004 update, ATI wasn't going to use the "Mobility Radeon 9600 XT" naming derivative for the M11, a decision that was settled some time ago. Based on the R360 core, M11 is manufactured on a low-k dielectric 0.13-micron process, which makes it the first mobile GPU of this nature. The benefits of a low-k dielectric are mainly related to shielding from crosstalk in high transistor density chips. The benefit of a low-k process is mainly the ability to scale up clock speeds while maintaining low power consumption and low thermal emissions. The latter reasons provide a big selling point to system manufacturers. Assuming that the M11 has an increase in performance over M10, it proves to be a very tempting solution, since it has no noticeable increase in the operating voltage and power consumption spec from the M10. There are no specific "official" clocks for the Mobility Radeon 9700, for the reasons we explained in our mobile GPU Q1/2004 update. However, ATI tells us that their customers are going to implement the Mobility Radeon 9700 with core clocks in the range of 390MHz to 450MHz, while the memory clocks will run in the range of 200MHz to 260MHz. One of the big design wins for ATI runs slightly above the memory range, which ATI is more or less mandating to their customers. This suggests that the aim for ATI in core clock will remain 450MHz, while the memory clock is something like 275MHz, since ATI and NVIDIA traditionally announce "official" clocks that are in 25MHz derivatives. Our experience with notebooks has been that the M10 GPU can run effectively with passive or minimal active cooling designs. Meanwhile, the M11 GPU needs a more extensive passive cooling design (i.e. a larger heatpipe) or a small heatsink fan. 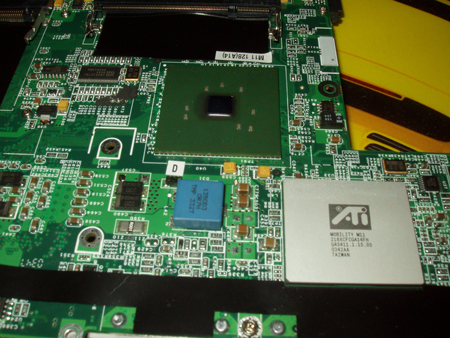 This seems to be the reason why ATI is utilizing an integrated heat spreader on some of its chips. As far as naming is concerned, you are probably scratching your head on ATI's choice of Mobility Radeon 9700. After all, the Radeon 9700 Pro (R300) has eight rendering pipelines, while the Mobility Radeon 9700 has four. The 9700 designation for the M11, though, is mainly to due to the Mobility Radeon 9600 and desktop "XT" designations. 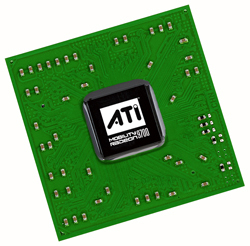 ATI has, thus far, reserved the use of the post-fix "XT" for desktop cards that support OverDrive, and the fact that the majority of laptops weren't going to implement OverDrive wasn't going to play to ATI's benefit. Prospective notebooks would just be puzzled in the end due to the lack of the feature, which couldn't be enabled by the end user because the system vendor would choose to disable the hardware component that supports the OverDrive capability. Making things a bit more complicated, the Mobility Radeon 9600 name has been stretched much further than originally planned. The Mobility Radeon 9600 Pro was supposed to feature GDDR2-M and OverDrive, but due to the cancellation of the memory by Elphida, the Pro version was just a slightly higher clocked version of the non-Pro. The addition of the Turbo Pro threw a monkey wrench into the mix by creating a three-tier Mobility Radeon 9600 family. Dubbing the M11 as Mobility Radeon 9600 XT would create a nice middle class suburbanite family of four. Because M11 is called "M11" and not "M10.5", ATI wants to emphasize that it is a generation jump, and using the 9600 obviously wouldn't create that impression (aside from the obvious conclusion that you would draw about its performance). Naming it "Mobility Radeon 9800" would no doubt be a stretch, so Mobility Radeon 9700 came as the most obvious solution. This is more of a lack of options due to unforeseen repercussions because of the Mobility Radeon 9600 three-tier naming mess. The question is then, "does the M11 live up to the name ATI has given it?" Of course, we will get to that in a bit.